Visit the Academy’s official Canadian Music Store, All You Need Music, and Shop Online 24/7 for instruments, recording gear and accessories shipped across Canada. Free shipping available! Take advantage of an Academy student discount at our partner music store, All You Need Music, and save with great educational discounts off select purchases as a confirmed Academy student. 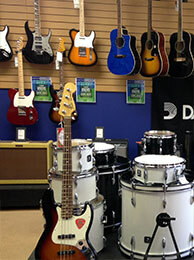 All You Need Music is an authorized Canadian dealer of thousands of high quality brand name instruments, pro audio equipment, accessories, DJ gear and more, carrying all the top brand names including Fender, Yamaha, Selmer, Epiphone, Gretsch, Washburn, Tama, Sabian, Zildjian, Stentor, Casio, Vox, Ludwig, Shure and more. Whether you're looking to buy a Guitar, Violin, Bass, Drums, Keyboard, Saxophone, or Pro Audio equipment, All You Need Music will offer you competitive student rates. Contact us today to inquire about any of our programs or for any questions related to your Academy student discount! 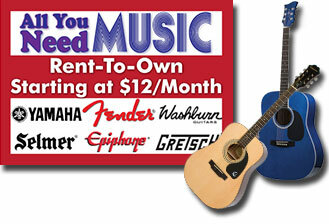 Rent an instrument starting at $12/month! 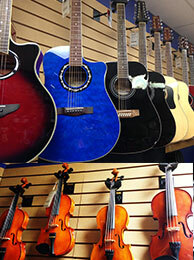 Want to try out an instrument before buying? Our Rent-to-Own program allows you to buy out (or return) your rental at any time. If you decide to buy your rental within the first three months, we'll apply 100% of your payments towards the purchase price. Even if you decide to return the instrument, we'll still give you a credit worth 50% of your rental payments to be used towards the purchase of another instrument (of equal or greater value). 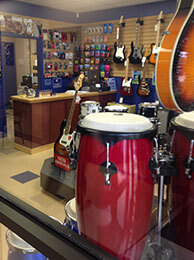 It's a no risk, cost effective way to try out a variety of different instruments! All instruments are hand selected and approved by a team of Certified Academy teachers which guarantees quality, dependability and price. Academy students save with great educational discounts off our advertised purchase price. Contact us today to inquire about any of our programs or for any questions related to your Academy student discount! 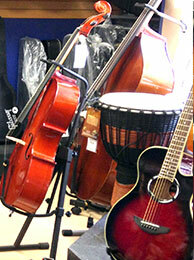 Do you need help choosing which size of Violin, Viola or Cello is right for you?